Last Christmas Crosby was 8 months old and completely unaware of the holiday season. We got her a swing for our backyard and she was set. This year I’m so excited for her to experience the season. 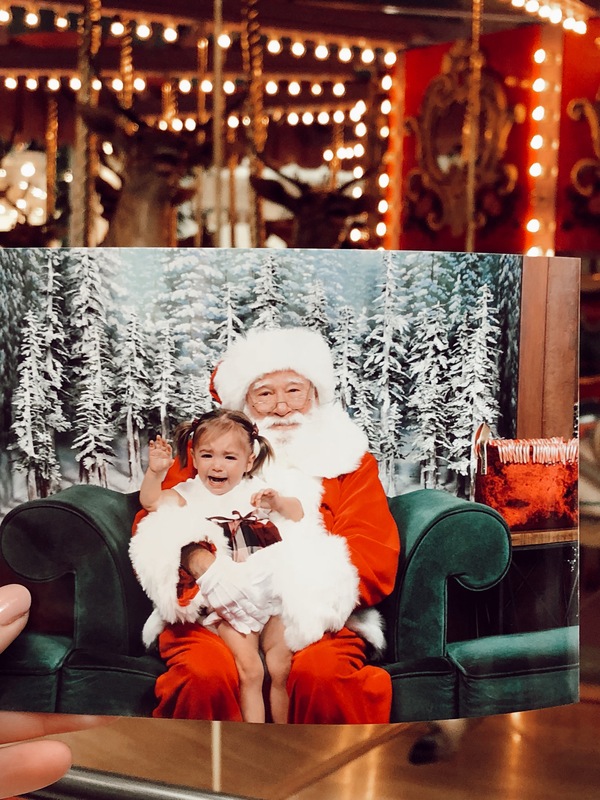 We already visited Santa and got the quintessential crying photo (see below). But there’s a lot of other fun things I’m excited to do with her before the end of the year. I also wanted to share a gift guide for toddlers. Some of the things we’re getting for Crosby (shh don’t tell her), and some that she has and loves. The best part is everything is available on Amazon Prime! She’s obsessed with doggies – calls them “daw-daws.” She recently noticed Mackie’s leash and now loves to try to walk her. I thought this would be the perfect gift for her. Another thing she’s obsessed with is my makeup. When I’m getting ready in the morning and my makeup drawer is open she’s in heaven pulling products out. I though this kit would be a good alternative to smearing my eyeliner on her hands… again. She has something like this and has just started getting into it. I love it because she can be creative without making a mess and there’s no cleanup. Win win. She’s a child of 2018 and is constantly subjected to photos with our cameras. It’s something she’s picked up on and now tries to imitate it with her fake phone. Jeff thought a toddler camera would be a cute toy for her to play with and maybe get some fun pics from. These are currently her favorite books. She loves any book that is interactive – has flaps she can open, etc. She loves reading them over and over… like seven times in a row. Anything that will hold her interest for that long is a major win in my book. Another way to express creativity without making a mess. This board is a great size you can throw in your bag and have while you’re out and about. I’m currently looking for things for her to play with in restaurants and think I’ll give this a try. We got this a couple months ago and she’s just getting into it. Another toy that’s great to bring on the go to keep them busy. Hope you have a great weekend – happy shopping!